Why do Flynn and Shaw have in common? Welcome to the this month's edition of the Cafe's most popular game. You will be given a pair or trio of films or performers, your task is to find the common connection. It could be anything--two stars who acted in the same movie, two movies that share a common theme, etc. As always, don't answer all the questions so others can play, too. There is a single best answer for each question. 1. The TV series McHale's Navy and the movie How to Frame a Figg. 2. Gene Tierney and Elizabeth Taylor. 3. Cary Grant and Ronald Reagan. 4. 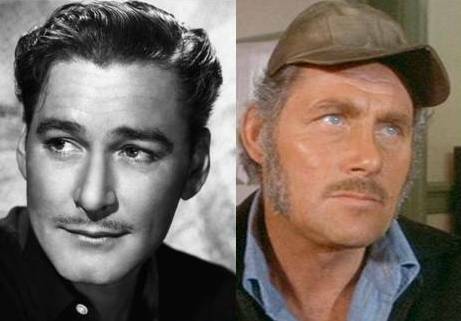 Errol Flynn and Robert Shaw. 6. Ralph Richardson and Ian McKellen. 8. Maureen O'Hara and Patricia Neal. 9. Fredric March and Bing Crosby. 10. Rod Taylor and Tyrone Power. 11. Lon Chaney, Jr. and John Malkovich. 12. Bert Lahr and Alan Young. 13. Dean Martin and Jack Lemmon. 14. Michael Caine and Ernest Borgnine. 15. The Thrill of It All and Champagne for Caesar. 14. Both appeared in Irwin Allen "Poseidon" films: Michael Caine in the sequel Beyond the Poseidon Adventure and Ernest Borgnine in the original film, The Poseidon Adventure. John, thanks for getting this edition off to a great start! 1. Joe Flynn played in both. 12. Lions. Lahr was, of course, the Cowardly Lion in Wizard Of Oz and Young starred in Androcles and the Lion. Well done! I thought this might be a little tough since not many people have seen Young's film. 15. Both movies involve a soap company sponsor. I thought you might get the CHAMPAGNE FOR CAESAR question! You are correct on all this, but there is another answer to #9. 4. Each actor played a heroic pirate, Flynn in "Captain Blood" and Shaw in the underrated "Swashbuckler." 11. Chaney and Malkovich both played Steinbeck's rabbit-loving misfit Lennie Small in the 1939 and 1992 versions, respectively, of "Of Mice and Men." Very good! Actually, I was thinking of Custer for Flynn and Shaw (which you got below). But they both played pirates, too. 5. Oscars for Best Original Song - Bacharach et all for Arthur's Theme and Keith Carradine for I'm Easy from Nashville. Wow, that may have been the toughest question on this quiz. I'm impressed (as usual). 4. Oops. I forgot to add that Flynn and Shaw each played General Custer, the former in "Santa Fe Trail" and the latter in "Custer of the West." True, but there's another connection, too. I enjoy both films, although Tyrone's isn't shown very often. 13. Both played comic book/strip writers. Well done. Amazingly, there's still another connection between Dean and Jack. Who would have thought it? Questions still needing answers (or additional answers in some cases): 2, 6, 7, 8, 9, and 13. And pilots in the AIRPLANE series. My first thought was the AIRPORT series connections, but these sure had a lot in common! That's a great one, but there's another unusual--and very sad--connection between these two actresses. 9 Both played stagecoach passengers.....March in Hombre and Bing in Stagecoach remake. Nice! They also both played a real-life person. 6. Both played wizards. Richardson in Dragonslayer, and McKellan in the LotR and Hobbit movies. Hey, I'm impressed...and let me say that DRAGONSLAYER is still my favorite dragon movie. Mine too! Dragonslayer is highly underrated, and Vermithrax remains my favorite of cinematic dragons. That dragon was just so well done. 2. Taylor "played" Tierney and her tragic situation in THE MIRROR CRACKED. Well done, Bill. I've often wondered how Gene Tierney felt about Agatha Christie's book. #9. Maybe a somewhat loose connection, but Crosby and March both played washed up alcoholic actors. March in a Star is Born, Crosby in The Country Girl. Another excellent connection between these two! Just realized I gave an inaccurate clue this afternoon. Crosby and March did not play the same real-life character. One played a real person and the other appeared in a movie adapted from a literary work by that person. Based on this updated clue, I believe you're talking about Mark Twain - March played him, Crosby starred in "A Connecticut Yankee in King Arthur's Court." Thanks for getting that one...definitely, the worst question on this quiz. The only question still needing an answer is #7. 7. Both did real-life bios? Good answers all for #7! This one was a little too vague, but we were going for the Halloween connection. Mulligan made TO KILL A MOCKINGBIRD, which features a Halloween climax. That completes our game for this month. Thanks to all the movie/TV gurus who played! Raquel Welch Skydives and Spies in "Fathom"